“The platonic form of catharsis. 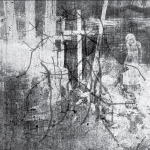 That is Larvae by Sutekh Hexen, who have grown over this last year to become a leader in noise-addled black metal. Layering their din over barely audible drums, treble-firey guitars and a murderous approach to vocals are all just the starting blocks. What ascends from beneath the raging waves of sound is nothing short of uplifting, transcendent. Larvae is the crowning achievement of this rising star.